As we’ve mentioned before, we love when we can put a face to a historic name. 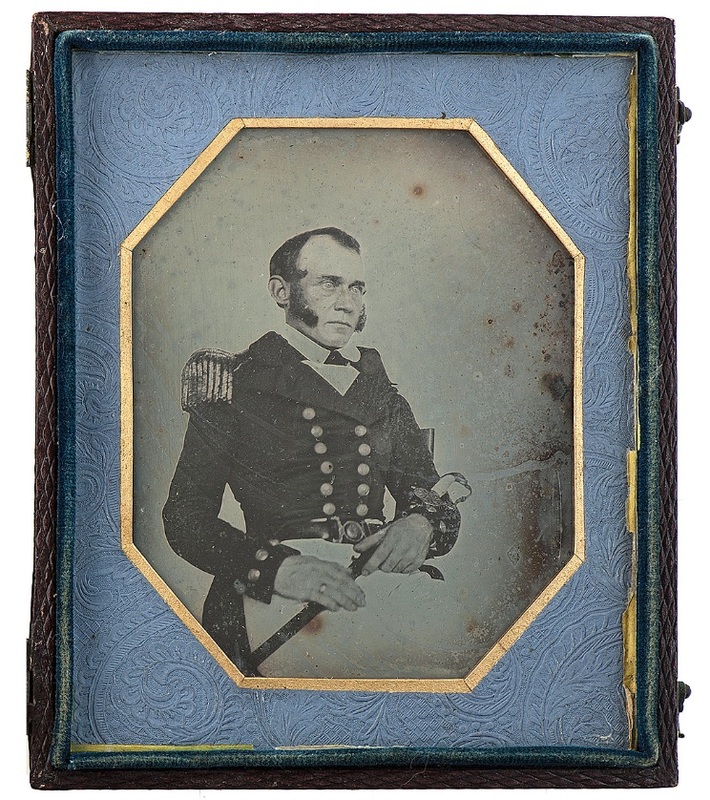 The museum recently acquired a number of artifacts related to Lieutenant Peter Turner, including a stunning daguerreotype photograph. 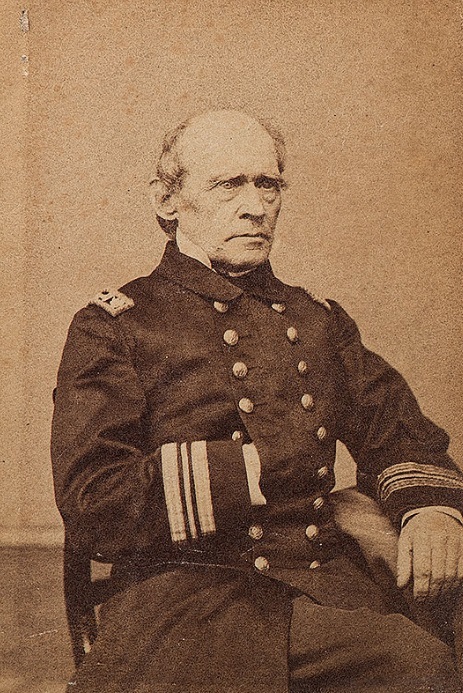 Turner was born in Rhode Island in 1803 into a distinguished naval family. His father William served as a surgeon during the Quasi War with France. Peter’s uncle, Benjamin B. Turner, joined the Navy as a midshipman in 1800. Seven years later he was killed in a duel with a fellow officer (a son of the famous Dr. Rush of Philadelphia). Another uncle was appointed a midshipman, but also died a few years later. Peter’s most famous uncle, however, was Daniel Turner, who commanded the brig Caledonia at the Battle of Lake Erie, and went on to long and distinguished career in the Navy. Despite this pedigree, Peter didn’t receive a warrant as a midshipman in the US Navy until he was twenty years old. Promotion came slowly in the antebellum navy, and he didn’t get his lieutenant’s commission until 1832. His uncle, now Commodore Daniel Turner, took him along on his flagship when he commanded the Brazil Squadron between 1834 and 1835. Peter later served on Constitution, again under the command of his uncle, between 1840 and 1841. In 1844 he visited Rio de Janeiro while serving in the frigate Raritan and there he sat for his portrait. Lt. Peter Turner in 1844. USS Constitution Museum collection. We don’t know the name of the photographer who took the image, but it might very well have been one of the several itinerant American daguerreotypists working in the Brazilian capitol. The image is crystal clear, but Lieutenant Turner seems ill at ease. He is posed in an unnaturally stiff manner, clutching his sword, and wears his badly-fitting undress uniform coat, with a wide rolling collar that looks ready to swallow his head. His enormous epaulet, worn on the left shoulder (remember, a daguerreotype image is always reversed), serves as an unmistakable marker of his rank. This may have been the first photograph he ever sat for. A 19th century note attached to the photo claims this was “a poor likeness,” but if not flattering, it might at least be revealing. The dark circles and bags beneath his eyes and the thinning crop of hair hint at the daily stress and long-term disappointment facing the now 41-year-old lieutenant. When he returned home, he was detached on “special duty” to the Navy Yard in Portsmouth, NH. The only ship he ever commanded was the Southampton, not even a proper warship, but a storeship. Not until two months into the Civil War was he promoted to commander. In 1863 he was made a commodore and put in charge of the US Naval Asylum in Philadelphia, one old sailor surrounded by many others. Perhaps the one great joy in his life was his wife and children. In 1842 he married Sarah Stafford Jones. She was twenty-three years his junior, and together the couple had five children. 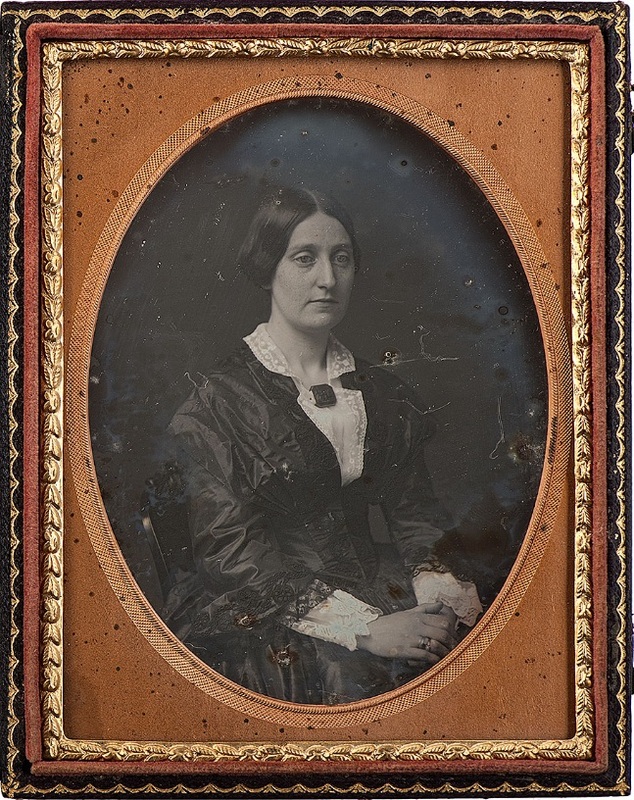 Sarah Turner, in a daguerreotype dated 1852. While more than twenty years younger than Peter, she outlived her husband by only four years. USS Constitution Museum collection. Turner as a sixty year old commander. USS Constitution Museum collection.